I love to have a Family Home Evening with my family the Monday preceding General Conference, about how we can prepare ourselves for conference. My children enjoyed this Family Home Evening and yes even at their young ages I still had them fill out the Question and Answer Sheet. I am glad I did, because I think it helped them to listen more intently for an answer. At the end of conference they each had answers on their sheets. Begin Family Home Evening by asking your family what you would need to be able to bake some fresh homemade bread or a batch of cookies? You would need a recipe, right? A recipe gives ingredients and instructions you need to follow to have a successful result of yummy food. Explain that for us to obtain our desire for exaltation and eternal glory with our Heavenly Father we also need to for instructions and directions that Heavenly Father has given us to help us safely and successful navigate through life. Show your family the scriptures, ask them what you are holding? Explain that the scripture are direction and revelation given to ancient prophets from our Heavenly Father. Explain that Heavenly Father still gives revelation and direction to current Latter-day prophets. Direction that is specific to the needs of the people who live at this time. 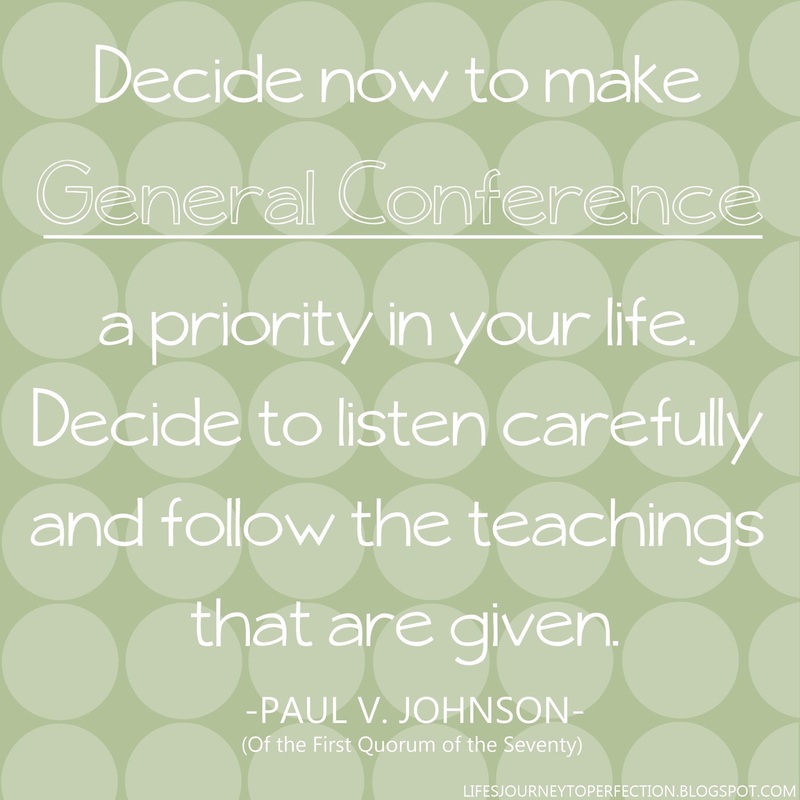 We are able to listen to the prophet, his apostles and leaders of the church during General Conference. If we prepare ourselves to receive direction and inspiration, we will receive personal revelation for the challenges and questions we have in our own lives. 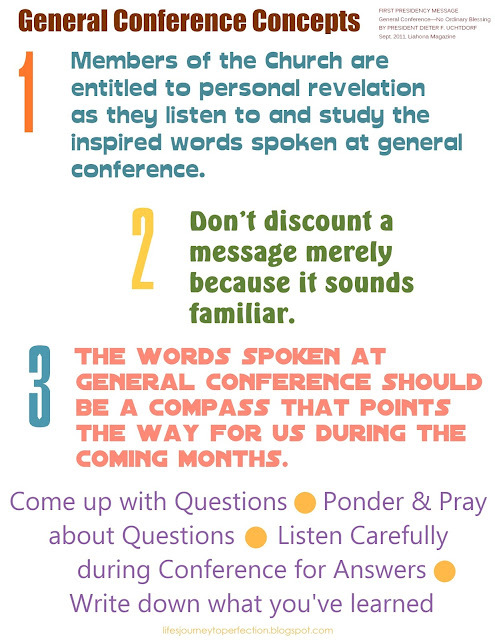 Using the below printable, "General Conference Concepts", discuss ways you can use these concepts to receive spiritual guidance during conference. 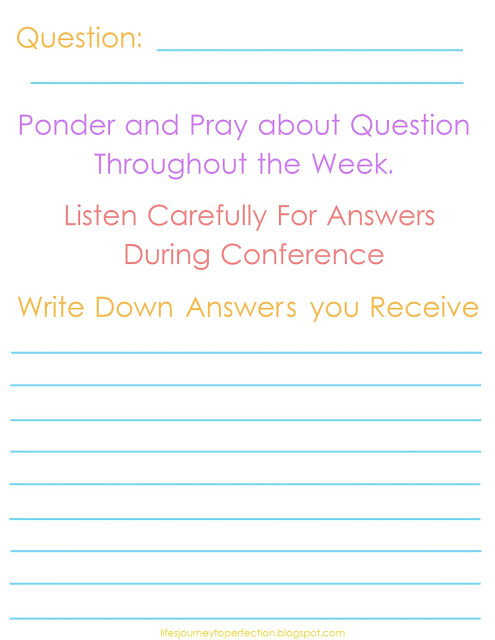 Give each family member a piece of paper, notebook or you could use the "Answers to Questions" printable below. Help each family member come up with a question that they have, in which they would like to receive an answer to during conference. Help them fill out their paper. 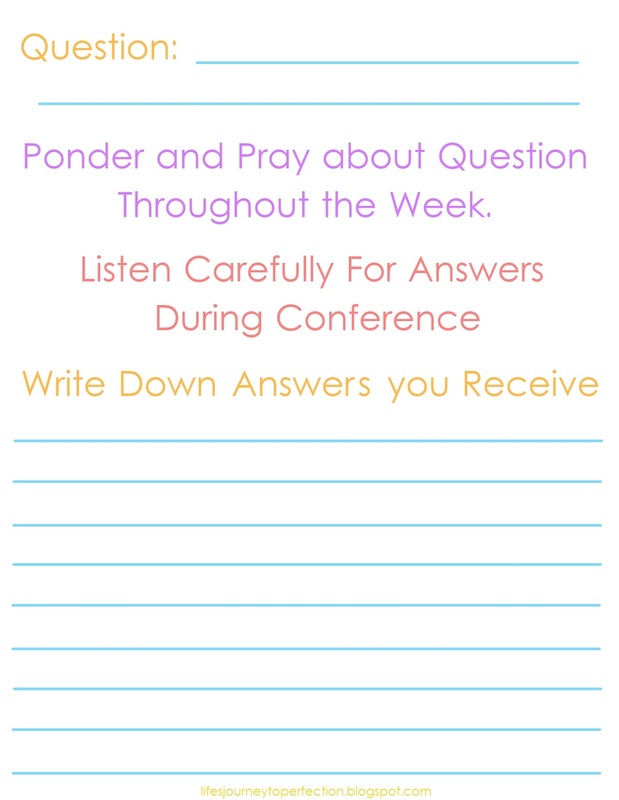 Ask them that throughout the week they should pray and think about that question. 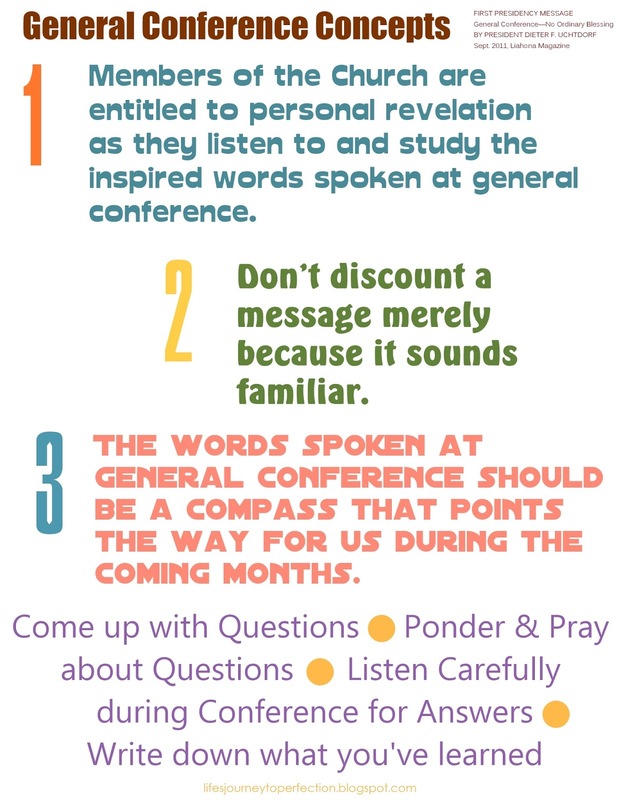 Then, ask them that during conference they listen intently for their answer. Have them record any answers or inspirations they receive on their piece of paper. Bear testimonies on Preparing Ourselves for LDS General Conference. Following the closing prayer, use a recipe, follow the directions and make something your family could enjoy. Mix sugar and applesauce together. Stir in flour, baking powder, salt, cinnamon and oats. Then add chocolate chips and/or raisins if you'd like. If it seems dry you could add a little bit more applesauce. Drop by spoonfuls onto lightly greased cookie sheet. Bake at 375 degrees for about 10 minutes.